This second study trip to China on April 16 was organised to provide Members an opportunity to explore the Chinese Direct Selling market and obtain updated information from the relevant Chinese authorities. Ye Wei, Deputy Director General of the Foreign Investment Administration, Ministry of Commerce (MOFCOM) and his team. The Bureau and the Ministry are directly involved in the regulation of Direct Selling in China. During the meetings, the topics of discussion include the consolidation of various administrations to improve the efficiency of regulating the Direct Selling industry in China plus updates on the progress of Direct Selling in Malaysia. 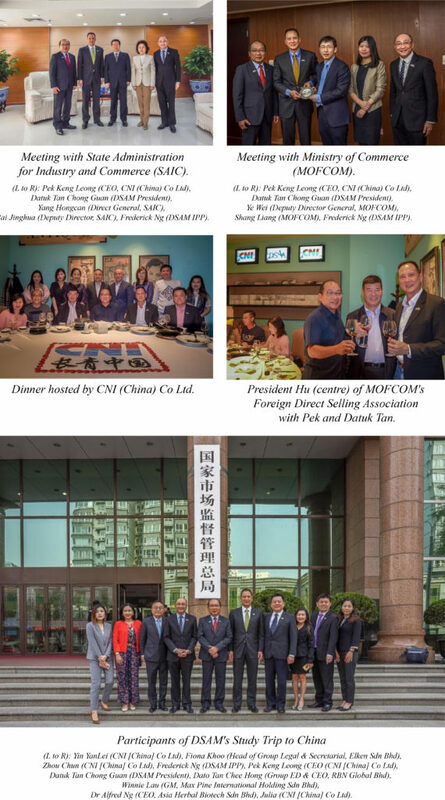 CNI (China) Co Ltd hosted a welcome dinner and was attended by President Hu, former President of MOFCOM’s Foreigner Direct Selling Association. Our Members were able to gather pertinent information from President Hu during the event. DSAM would like to thank CNI (China) Co Ltd for their assistance in making this study trip a success.